Wisdom and Patience are like man and his shadow which never separate. Even in utter darkness when shadow, which represents the wisdom seems to have gone; the man, which is symbolic of Patience only needs more patience to make Wisdom come out. Right from the word go, Snail and Slug were siblings. Slug is just like Snail for except it doesn't have shell. And Snail too was once like this. Both of them were without shells. refuge in times like this is all we need." Said the snail. "Can't we go to the creator! Who knows, we may be favoured with a kind of home..." The slug suggested. "His throne is very far, you know. 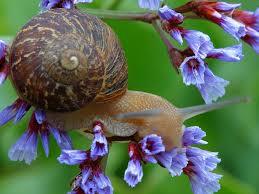 Many are seas and deserts to cross..." The snail discouraged. "But at the end, we shall have our own shield." "It is worth given a trial." relishing praises." He told them. marveled and also scared. So, they quickly left. "In few days time, we shall have a home of our own. We must leave on time..." Said the snail. "Count me out! I'm not going again." "We are not going to get shell like tortoise. We are just wasting our time and strength. May be it's our fate..." The Slug has lost patience. "But we were told our time was near. And in the new moon, we shall indeed have our own shells..."
"Go and get it for yourself. I think I'm okay like this." "You are a fool." The slug told the snail when he returned. "Think you will ever get a shell? You're wasting your time. Try to be wise, how many times have you tried for it?" These taunts made snail feel like a failure. But despite the fact that her patience cast no shadow of wisdom, she still decided to have more patience. almost new moon, won't you go again?" "I will, since I've not been banned from doing so." The snail went and returned with a beautiful shell. The slug loved the snail's shell so much that she decided to try her own luck. But she returned with no shell. "You've missed your chance of getting a shell." The slug was told. Ever since, the snail has been parading her beautiful shell while the slug, out of shame, confined herself to rivers and swampy areas.